Is Urban Forestry a Risky Business? Is urban forestry a risky business? Find out in this blog by the #EFUF2016 invited blogger, Prof. Dr. Cecil Konijnendijk van den Bosch, professor of urban forestry and editor-in-chief of the scientific journal Urban Forestry and Urban Greening. Having been an urban forestry researcher for about two decades now, I have had the pleasure to attend many different conferences and seminars across the globe. Not all of them are as good and rewarding as the annual European Forum on Urban Forestry, obviously, but there is always something one learns and takes home. During the last week I was at the 2nd Urban Tree Diversity congress in Melbourne, Australia. 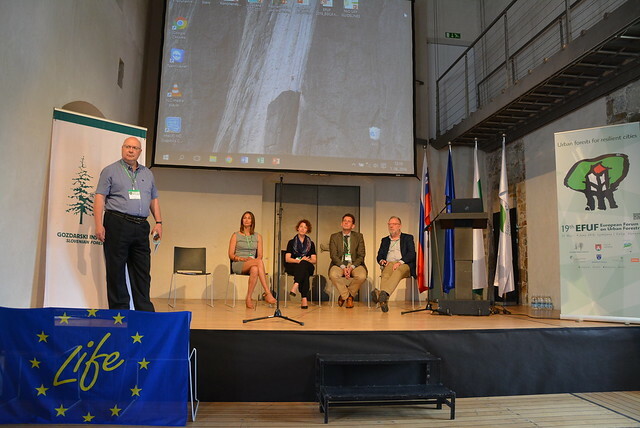 Over 300 participants discussed the many aspects of tree diversity, from selection and resistance to pests and diseases to the diversity in links between people and trees. At the conference we spoke, as always, of the many benefits of urban trees and urban woods. However, it struck me once again how we urban foresters sometimes tend to be almost ‘apologetic’ in terms of the risks associated with trees. In our research and practice we have often focused on minimising risks in terms of e.g. tree and branch failure. Many books and articles have been written about hazard trees, visual tree assessment, branch failure, storm damages, and so forth. At a seminar at the University of Sydney after the Melbourne conference, my Australian colleague Ian McKenzie raised this issue of our biases view on risk related to urban trees. Ian is somewhat of a ‘rare bird’, by the way, as he is both an arborist and a local politician. When he spoke of our problematic relation with risk, and the way other professions look at urban forestry primarily as a ‘risky business’ (or rather: a risk-minimising business), I realised that we urgently need to turn things around, in the minds of politicians, the public and other professionals, but also within our own field. It is risky for a city NOT to have trees. When walking the streets of Sydney as well as many other cities, some streets can be scorching hot – and these are typically those streets without trees. Thus one is exposed to the risks of succumbing to heat and higher vulnerability to skin cancer in tree-less environments. City governments have the statutory obligation to provide us with basic infrastructure, clean water, safe roads, etc. They are also responsible for enhancing public health. So why should it not be seen as a duty for them to provide us with canopy-covered walkways and cycle routes, where threats to our health because of radiation, pollution, stress etc. are minimised? Time for a paradigm shift, perhaps? Something to discuss at the upcoming European Forum on Urban Forestry, in Europe’s Green Capital of Ljubljana. The overall theme of the Forum fits well, as we will discuss the contributions of urban forests to resilient cities. To me, resilient cities are also vibrant and healthy cities, offering safe and attractive places for people of all ages to live, work and play. Resilient cities are also cities where the small risks of trees or branches falling and hitting someone are far outweighed by the crucial benefits of trees. Urban forestry is not a risky business, it’s a pure necessity. Featured photo by Brian Yap.